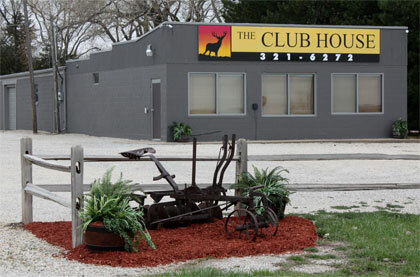 The Club House is a reception hall / event rental facility available for small RV Rallys, receptions, training events, birthday parties, family gatherings, holiday fun, etc. The Club House is a rustic, but elegant, climate controlled 1500 sq ft. building. The banquet hall / meeting facility accommodates 80 people with ample seating and tables. The kitchen area has a full size refrigerator and a full size freezer. There is an oven and stovetop available, including a microwave oven. If you don't care to do your own dishes, there is also a dishwasher in the kitchen. For easy clean up, there is a food disposable available in the kitchen's double sink. There are men and women's handicap accessible restrooms located within the Club House. The rental facility has satellite cable, 3 TV's, a DVD player, and has HDMI hookups to link to a computer. Call us at (316) 321-6272 for more information. 10 or more RV's in a group can use the Club House for FREE when staying in the campground. Special rates for non-profit organizations, RV tenants and Donges Properties LLC's tenants.